After years at sea, sockeye salmon returning to their freshwater homes may be guided by an early memory of the Earth’s magnetic field, encoded at the site where natal streams empty into the Pacific Ocean, according to a an Oregon Sea Grant-supported study published today in Current Biology. 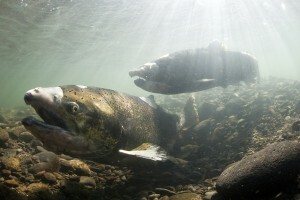 Oregon State University’s Nathan Putnam and David Noakes, along with researchers from the University of North Carolina Chapel Hill, the University of Washington, and the University of California Davis, pored over 56 years of dta from federal fishery scientists who tracked the movements of salmon at the mouth of British Columbia’s Fraser River, where fish must choose to swim north around Vancouver Island, or around to the south. They matched that data with measurements of the Earth’s geomagnetic field, which shifts predictably in strength and orientation over time and found that fish tended to choose the path where the field strength was more similar to that of the river mouth when they’d left, two years before. Scientists hope the finding will help solve the mystery of how salmon find their way back to the rivers of their birth across thousands of miles of ocean. It’s already accepted that in the final stages of the journey to their breeding grounds, salmon use odors to guide them back to the stream or inlet where they hatched. But how the fish find their target river remains a mystery, although scientists have suspected for a while that magnetic cues play a role. Last summer, a team including UNC-Chapel Hill researcher Kenneth Lohmann – also part of this study – reported that rotating magnetite crystals in a fish nose responded to magnetic field orientation, providing a possible biological mechanism for magnetic field tracking. The OSU researchers hope to further investigate the magnetic field correlation by subjecting captive fish to artificial magnetic fields and studying their behavior.